Many tropical rainforests harbour species-rich assemblages of frogs and, consequently, of tadpoles. These larvae are often morphologically highly diverse, especially in their oral structures. Whether this might represent an important axis of ecological partitioning in frog assemblages remains an untested hypothesis. In general, it is poorly known how diverse tadpole assemblages are organised. Using information from Madagascar’s remarkably species-rich stream tadpole assemblages, we analysed the distribution and co-occurrence of 44 species. We also assessed the importance of phylogenetic history and eco-morphological adaptation for habitat selection at two functional and two spatial levels. We show that both rare and common species exist in most morphological clusters and phylogenetic groups of tadpoles. Habitat characteristics of the streams and surrounding forest influence species composition. Whereas there is a general trend in preferring wide and deep streams without a steep slope for most species, some of the morphological clusters separate along specific habitat variables. Stream choice is influenced both by phylogenetic history and morphological adaptation. 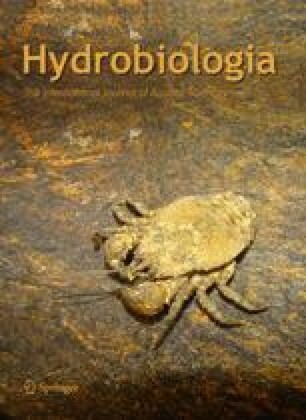 Within streams, tadpoles partition microhabitat mainly according to their morphological cluster but without phylogenetic signal. Species dissimilarities of habitat selection on both spatial scales are not correlated. We found no evidence for competition in the tadpole assemblages studied. The online version of this article (doi: 10.1007/s10750-012-1301-z) contains supplementary material, which is available to authorized users. We are grateful to S. Ndriantsoa, E. Rajeriarison, T. Rajoafiarison, H. Rasolonjatovo, D. Razafindrabe, E. Reeve, and J. Solo for their contribution to fieldwork. Logistic support was provided by ValBio, MICET/ICTE, and Madagascar National Parks. Molecular identification of tadpoles was carried out with help in the lab by G. Keunecke, S. Janssen, M. Kondermann, and E. Saxinger. This study was carried out in the framework of a cooperation accord between the Département de Biologie Animale of the University of Antananarivo, Madagascar and the Technical University of Braunschweig, Germany. The Malagasy authorities kindly issued research and export permits. Financial support was granted by the Volkswagen Foundation to MV and RDR, by the Deutsche Forschungsgemeinschaft (Grant VE247/2-1) to MV, AS, and JG, and by the Deutscher Akademischer Austauschdienst to RDR. Bates, D. & M. Maechler, 2010. lme4: linear mixed-effects models using S4 classes. R package version 0.999375-34 [available on internet at http://cran.r-project.org/web/packages/lme4/]. Fox, J. & S. Weisberg, 2011. car: companion to applied regression. R package version 2.0-10 [available on internet at http://cran.r-project.org/web/packages/car]. Henning, C. & B. Hausdorf, 2010. prabclus: functions for clustering of presence–absence and abundance data. R package version 2.2-2 [available on internet at http://cran.r-project.org/web/packages/prabclus]. Oksanen, J., R. Kindt, P. Legendre, B. O’Hara, G. L. Simpson, P. Solymos, M. H. H. Stevens & H. Wagner, 2009. vegan: community ecology package. R package version 1.15-4 [available on internet at http://cran.r-project.org/web/packages/vegan]. R Development Core Team, 2009. R: a language and environment for statistical computing. R Foundation for Statistical Computing, Vienna [available on internet at http://www.R-project.org]. Sarkar, D., 2008. lattice: lattice graphics. R package version 0.17-17 [available on internet at http://cran.r-project.org/web/packages/lattice]. Venables, W. & B. Ripley, 2010. MASS library (R package version 7.3-5 [available on internet at http://cran.r-project.org/web/packages/MASS].